Overall, the Sealy Hybrid Essentials Trust mattress offers good value for money and is a sturdy, comfortable hybrid bed. With a combination of highly supportive innersprings, a high-quality edge guard, and comfort foam to cushion the body, this mattress receives glowing reviews for the level of comfort it provides for a great night’s sleep. Sealy Hybrid Essentials Trust bed has a medium-firm feel that combines the best features of innerspring and memory foam mattresses to create a supportive feel with ‘a touch of contouring comfort’, which should suit back, side, and stomach sleepers. As a part of Sealy’s Posturepedic range, the mattress also includes Sealy’s signature Posturepedic technology, which means the centre of the mattress is reinforced to support the body’s heaviest areas (the hips and lumbar area) to keep the spine in a neutral position while you sleep to encourage better posture and relief from back aches and pains. This technology, combined with firm support from a sturdy innerspring system and cushioned comfort from a layer of foam, results in a mattress designed to suit most body shapes and sleep preferences. You want deep pressure relief: A standout feature of the Sealy Hybrid Essentials collection is Sealy’s Posturepedic technology, which provides reinforced support in the centre of the mattress to give your body deep pressure relief where you need it most. You prefer the feel of an innerspring mattress: Some people simply don’t like the feel of a foam mattress. The Hybrid Essentials Trust is ,therefore, a good option, as it includes the benefits of foam without having that ‘sinking’ feeling associated with all-foam mattresses. You want the benefits of foam without the feel: This mattress has a layer of foam to provide contouring comfort, but maintains a Medium-Firm feel due to its innerspring system, creating an ‘on-top’ feel that is perfect for people who want pressure relief but would prefer to avoid sinking into their bed. You tend to sleep hot: A hybrid mattress is a good choice if you tend to overheat when sleeping. This mattress has hourglass-shaped coils which allow air to pass easily through the mattress, as well as a Moisture Protect™ cover, which draws excess moisture from your body for a more comfortable, cooling surface. The Sealy Hybrid Essentials Trust mattress has a Medium-Firm feel, sitting somewhere between a 7 and an 8 on a 10-point scale of firmness. Sealy describes the hybrid mattress as being ideal for people who “prefer a supportive feel with a touch of conforming comfort”. With layers of comfort foam above an innerspring coil system, this mattress will have a ‘sleep on top’ feel with the contouring comfort of foam but without the associated sinking feel. However, in terms of support, the most frequent criticism of the Sealy Essentials collection is that the mattresses can begin to sag in the middle and lose their supportiveness. If having a durable mattress that will withstand the test of time is a priority for you, this is definitely a drawback to keep in mind. The Sealy Hybrid Essentials Trust mattress is constructed from three layers. On top is a Moisture Protect™ stretch knit cover with moisture wicking technology, designed to draw heat and moisture away from the body for a comfortable, cool surface. Underneath the cover is a 1.5-inch layer of Sealy ComfortSense™ foam, an innovative gel memory foam designed to respond to your body’s unique shape for a more comfortable surface. This is followed by 2 inches of SealySupport foam pillow top for added cushioning that will contour to your body while you sleep. To prevent the foam having too much of a ‘sinking’ sensation, the final layer is a Response Pro™ Encased Coil System to provide durable support and pushback. The system is made from densely packed hourglass-shaped coils, designed to reduce motion transfer more effectively, while also providing more targeted support to pressure points. For added support and durability, a DualFlex™ Coil Edge System surrounds the innerspring system, ensuring that the full mattress surface can be used without losing support around the edges. Finally, a 1-inch layer of Sealy Support Firm Foam provides a base layer of cushioning support to the mattress. Altogether, these layers create a medium-firm mattress designed to offer contouring comfort with reinforced support at your body’s pressure points. The layers make for a total height of 12 inches, although there is also a thinner 9 inch version available. It can be used with an adjustable base or with a standard foundation. In terms of motion isolation, the hourglass-shaped innerspring coils in the Hybrid Essentials Trust mattress are designed to minimise motion transfer across the mattress to ensure it allows for an uninterrupted night’s sleep, even if your partner gets in and out of bed beside you. Additionally, the layer of gel memory foam not only provides contouring comfort, but also helps to isolate motion. Finally, the DualFlex™ Coil Edge System is designed to add support to the mattress from edge-to-edge, so there should be no disruption in your sleep if you roll closer to the edge of the mattress when sleeping. The Hybrid Essentials Trust has several cooling features that should ensure the mattress remains cool throughout the night. Generally speaking, hybrid mattresses are a good choice if you’re looking to get the contouring benefits of foam without its downsides. Memory foam mattresses tend to trap heat and aren’t always suitable for people who sleep hot – but hybrid mattresses off-set this problem with an innerspring coil system that allows air to pass through the mattress easier. Additionally, the ComfortSense™ foam is gel-infused, which not only provides a cushioned surface but will also help with temperature regulation. Finally, the Moisture Protect™ cover is specifically designed to draw excess moisture away from the body throughout the night, ensuring you stay cool and comfortable as you sleep. 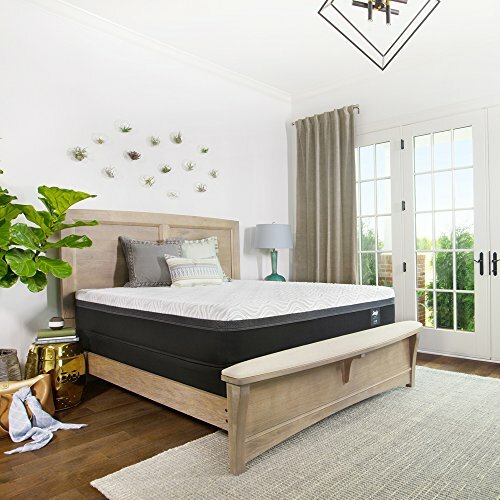 The Hybrid Essentials Trust receives good reviews for its ability to regulate temperature, with many users finding the mattress cool and comfortable to sleep on with no real motion transfer across the mattress. Another great feature of the Hybrid Essentials Trust mattress is its level of responsiveness, supporting and contouring to the body as you move in your sleep. One thing you may want to be aware of is that multiple user reviews say that the foam in this mattress takes a few minutes to soften from your body heat, so if you do move around a lot in the night you may find yourself moving onto a firmer surface until the foam has time to react to your body heat and soften around you accordingly. The Sealy Hybrid Essentials collection is listed as being CertiPUR-US certified, which means the foam used in this mattress is free from harmful materials, including ozone depleters, PBDEs, TDCPP, TCEP, mercury or heavy metals, formaldehyde, or phthalates. The mattress is shipped in a box and wrapped in plastic sheeting and there are no reviews reporting a strong off-gassing smell – if anything, the mattress will probably have more of a ‘new’ mattress smell that will dissipate within 24 hours. In terms of eco-friendliness, the Sealy Hybrid Essentials Trust mattress isn’t the most natural mattress you could go for, but the foam is at least certified to be free from harmful materials. The Essentials collection is one of Sealy’s most affordable mattress collections, with the Premium and Performance collections priced much higher. The Hybrid Essentials Trust mattress, therefore, offers great value for money, with the same contouring features of a memory foam mattress but at a fraction of the cost. What’s more, with a warranty attached to every Sealy mattress purchase, you can rest assured that your investment is protected if you do go for this mattress. Unfortunately, Sealy doesn’t appear to offer a sleep trial period with the Hybrid Essentials Trust mattress, so there’s no opportunity to test the mattress out in your own home. However, they do provide a 10-year warranty with your mattress to cover you against workmanship and material defects. Q: What foundations can I use with the Sealy Hybrid Essentials Trust mattress? A: This mattress is suitable for use with an adjustable base, providing an added opportunity to fully customise the mattress to suit your sleeping preferences. However, it can also be used with a standard box spring or foundation, provided it has extra centre support to prevent sagging and bowing. Q: How do I care for the Sealy Hybrid Essentials Trust mattress? A: Sealy recommends rotating your mattress on a regular basis to refresh its comfort and prevent body indentations. They also recommend using a mattress protector to keep your mattress clean and free from stains. If you do need to clean the mattress, don’t get it wet or use any dry cleaning fluid – simply spot clean with a damp cloth and warm water. Overall, the Sealy Hybrid Essentials Trust mattress offers good value for money and is a sturdy, comfortable hybrid bed. With a combination of highly supportive innersprings, a high-quality edge guard, and comfort foam to cushion the body, this mattress receives glowing reviews for the level of comfort it provides for a great night’s sleep. However, it also receives some criticism for it’s lack of durability and longevity and some customers have reported sagging, over time. The only other real downside is that you don’t get a sleep trial period to test this mattress out before committing to it, so be sure you do your research thoroughly before buying and make sure you fully understand the terms of the warranty.